Loss of proliferation in ATL-derived cell lines by the Pim-kinase inhibitor AZD1208 (D). Cell counts were repeated at least twice. Results represent the percentage of cells alive after 5 days of Pim inhibitor treatment, compared with 5 days treated with DMSO. For AZD1208, cells were treated with 0, 5, or 10 μM AZD1208. Normal PBMCs (n = 2) were used as a control. Western blots indicate loss of Pim1 targets, p-4EBP1 (Thr37/46), p-p70S6K (Thr389), and loss of pBad (Ser20) (negligible for Smi-4a) after 24 hours with 0, 5, or 10 μM AZD1208; or DMSO control. Blood, 2016, 127(20):2439-50.. AZD1208 purchased from Selleck. Primary AML sample (AML#6) treated with the pan-Pim kinases inhibitors AZD1208 (1 μM) or LGB321 (1 μM). Western blots were done using RSK2, Pim2 and β-actin antibodies. Leukemia, 2018, 32(3):597-605. AZD1208 purchased from Selleck. AZD1208-resistant cell lines demonstrate sustained mTOR signaling upon treatment. Cells were treated with 2 μmol/L AZD1208 for 0, 24, and 48 hours, followed by Western blot analysis (n = 3). Mol Cancer Ther, 2018, 17(4):849-857. AZD1208 purchased from Selleck. (D) IC50 values calculated from cell viability assays of indicated cell lines, with the top concentration for PIM447 and AZD1208 being 10 μM. Shown is the mean of four replicates ± SEM. (E) IC50 values calculated from cell viability assays of indicated cell lines, with the top concentration for AEB071 being 10 μM and 1 μM for Ibrutinib. Shown is the mean of four replicates ± SEM. (F) ABC DLBCL cell lines, grouped based on drug sensitivity, with known somatic mutations. Oncotarget, 2016, 7(39):63362-63373. AZD1208 purchased from Selleck. 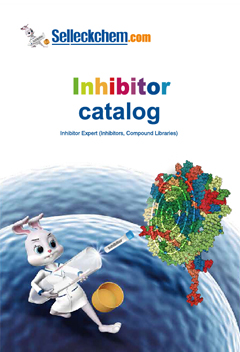 Orally bioavailable Pim kinase inhibitor that has been tested in Phase I clinical trials for treatment of advanced solid tumors and malignant lymphoma. What is your recommended solvent of S7104 for mouse in vivo studies by oral administration? 1%CMC-Na is recommended and you will get a suspension. It is ok for oral administration. I would like to ask which solvent I should use to dissolve AZD1208 for mouse study. Can AZD1208 be dissolved in 5% dextrose? AZ1208 can be dissolved in 5% dextrose at 10 mg/ml as a suspension. If 5% Tween 80 added, the suspension will be more homogeneously. 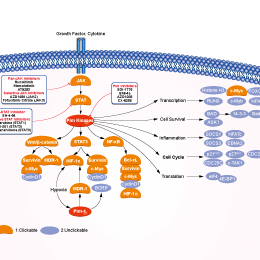 Features:SMI-4a (5μM) synergizes with rapamycin (5 nM) to cause significant growth inhibition of leukemic cells.